I'm so excited to share that I have a new block in the Quiltmaker 100 Blocks vol.3 hitting the bookstores May 10th! I used Central Park by Kate Spain. I love the animal print as the center focal fabric. I can envision this block with any novelty fabric too. Here is one layout possibility so far. Now rush out and BUY it! If you'd like to win a copy of the magazine, leave a comment here. As well there are several other designers showing off their blocks today. You can click on their name and it will direct you to their site. Love Central Park, and the way your block turned out! Congrats on being featured! Such an adorable block! Perfectly suits the fabric choice for this one. Bravo! The second magazine was very nice (I got a copy for Christmas) and it would surely like a friend. Thanks for the chance. And, congratulations on being published. I just love these books! I have No.2 and this one looks just as good! I lOVE Central Park (the fabric line... never seen the actual park!). Congratulations! I like the block...and would love to win the book. Love how you fussy cut the middle square! Turned out really nice-I love Central Park, too! I love all the blocks I've seen so far! I would love to have a copy of this lovely thing. I'm sure that I won't find a copy of this anywhere near me.. oh rural america. Central Park is lovely fabric and it looks great in your block! Thanks for a chance to win. Love your block! I think the Central Park is just perfect! I wish I could!!! Run out and buy it that is..... thanks for the chance to win a copy. Wonderful block for my novelty prints. Congratulations on your been published. The blog tour has begun!! Enjoying the many blogs to visit this morning. Love your block! I'd love to win since I didn't get vol 1 or 2. I'd really love to see a quilt with all the blocks together! Thanks for the chance to win! Having fun this morning with my cup of coffee, hopping around and seeing the great blocks. What a unique, but easy-to-assemble block! Thanks for the chance to win the book! I love that you fussy cut the fabric for the center square. Your block is so cute! Your block and your choice of fabrics are super! I love a block where you can feature a novelty print in the center. I love your block, especially your fabric choices! Congrats on being in the magazine...quite an honor. Love the fussy cut center...lots of possibilities! Congrats on being published! Yeah! Congrats on having your block in the book, it's very pretty. Love your block - love the fabric. What a great block Vickie! Would make a fun I spy quilt. 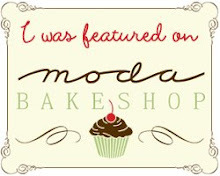 Congrats on being featured in the magazine, and thanks for a chance at winning. What a delightful block! Love how you fussy cut the center. I can envision this block for an "I Spy" quilt. Thanks for the giveaway! Great block for showing off a large print. Thanks for sharing! I LOVE your bock and I would love a great read and inspiration. I just finished spring semester in school and my creativity is not flowing right now. Great block and fabric choices! Thanks for the opportunity to win the book. Congratulations! I love the fussy cut center. What a great block for using novelty prints! Thanks for the opportunity to win! 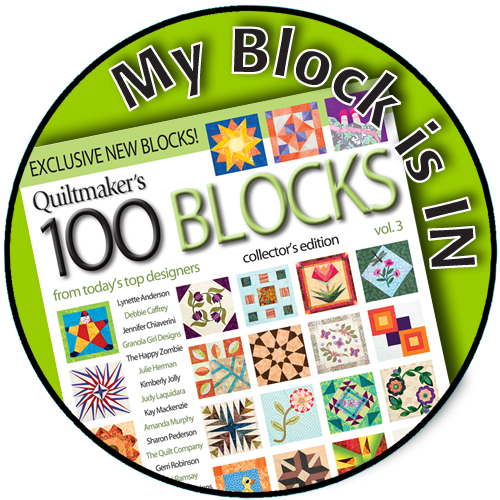 Your block is a great new spin on I spy quilts too! Fantastic! That block is too cute! So cute! Love the way the eye is led to follow all the way around the block! Good job! Love your block and it has nothing to do with that amazing Central Park fabric! I think it would make some amazing designs in a quilt. Very nice block, love the fabrics. Thanks for bringing in the sunshine! What a great block and congrats for being chosen to be in the new book. Novelty fabric is what won me over! I have horse fabric I picked at the Fabric Shack (thought you would appreciate that as a Buckeye) and it has sat around for the last 6 months. 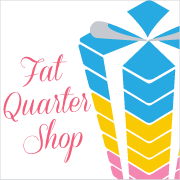 Do you have any examples for quilt layout? Beautiful block! I would love to win that magazine! I like your block. Very cute with the focus fabric. Thank you for the opportunity to win a copy of the magazine. Congrats Vickie on your block love it and would love to win a copy of the magazine! I love your block! Very unique and different. congrats on being in the mag! What an honor! Thousands of quilters will be making quilts inspired by the blocks within its pages. When I first saw your block I thought it use some weird shape, then I looked again, whew! That's better, lol. Congratulations on being included, and thanks! Love your block - I need the new magazine for my collection. Wonderful use of fabrics, love the fussy cutting. Congrats on being in the magazine. Love your block. Thanks for the chance to win a copy of the magazine. For some reason, this magazine is NEVER available to buy locally, so I'd LOVE to win a copy from you! Your block is lovely! Great job. I really like your block. As I scrolled down to view your block a smile leapt to my face! What a happy block. Thanks for sharing and congrats! Super cute block! Love the center! I like your block and especially like the fussy cut center. Congratulations on having a block in the magazine. Lovely block! I really hope that I win one of the 100 Blocks, Vol. 3, to get the chance to make all the blocks. Thank you for the chance to win! Have a wonderful day! Congratulations on being included in the magazine! Love the animals in the center of the block! Thanks for the giveaway. Congrats on having a block in the Mag! I love it. What a sweet block! Two children, full-time job, quilting, blogging .... I'm exhausted just typing all that! 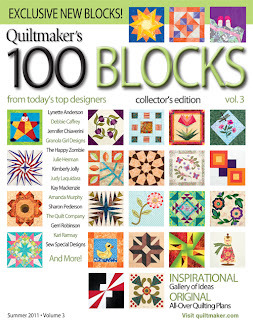 Can't wait to get started on some of these blocks in "100 Blocks - Volume 3". I love the idea of using a feature fabric for the middle square. It can work with so many fabrics. Children's quilts are what come to mind right now. Neat block--I have some ideas for using this in an eye spy type quilt. Your block is so cute great for kids quilt Love it! Like to follow your work Always great! Thank You for the Chance to win! I really like that block, and love the way it highlights the center fabric. Congratulations on making the grade and thanks for the chance to win! What a cute I Spy quilt this design would make! :) I'd love to win a copy of the magazine. This looks like a perfect block to use "pictures" or fussy cuts in the middle. I see an "I Spy" --- so much simpler than the old hexagon. That's a neat block. Love the central focal point. Love that you would be able to use a "fussy cut" picture in this block. What a charming block. Can see a lot of possibilities with different fabric use. What a fun block. I can easily see this one being used in a quilt for my new granddaughter. Congratulations on being chosen for the magazine. Nice block. Will make a nice quilt with any focus fabric. Really love your block! Congrats on being chosen! Lovely block - Congrats on being featured! What a cute fabric for your block! I love novelty prints. Congrats on being selected for the magazine. I like the way you've used a novelty fabric in the center of the block. Very cool. Congrats on being in Issue 3. I cannot wait to get Issue 3. Great use for the novelty fabric, and I love the secondary design from your blocks. Can't wait to see the book. Two kids, a full-time job, AND you have a block in the new "100 Blocks"! You go, girl! What a clever pinwheel style of block! I love it! Just when you think you've seen it all, someone comes up with a new shape! How neat! This one Im going to try. Congrats and thanks! Great block. Congrats on being included in the new 100 Blocks mag. Thanks for the giveaway. Love your block! Simple and so many possibilities! Love Kate Spain AND what you did with it! I'm feeling this block for some pillows I want to make. Great block to use novelty prints! Congrats! I can't wait to get this issue! Wonderful block! I'll definitely be buying this magazine if I don't win one on this tour! Oh I LOVE this block!! Congrats on making the "cut"! What a cute block..LOVE it! Vickie ... so cool to see you in this magazine ... cooler still to see your block. Very nice and one I'd put on the top of my 'have to do very soon' list. Thank you so much for this chance to win a copy of the magazine and Congratulations!! Lovely block w/ cute fabric! thanks! Very nice. Love the design effect when the blocks are put together. What a cute block, with lots of possibilities! Thanks for the giveaway too! now, that's a new twist that I cant figure out just by looking at it! Love this block! How wonderful for a child's quilt. Thanks so much for sharing. And congratulations on your achievement. Oh how fun! Love the block, love the fabric - all this to love AND a chance to win? Life is good. Congratulations! I like your block especially your use of a novelty print in the center. Thanks for the giveaway. Fantastic block and I LOVE the quilt!!! Great block! I'm in the middle of a Central Park quilt top right now and can't get enough of that fabric! I love the secondary design when you set your block side by side. Fun! Love this block! What a cute way to use Central Park! I really like your block. It has a nice but striking simpleness to it that I enjoy! Congratulations! What a cute block. I love this block. It looks complicated at first, but then you realize it really isn't. Congrats! Awesome way to highlight your favorite fabric! Great job! 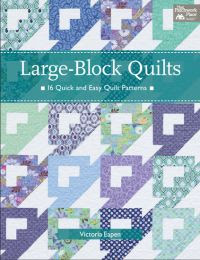 It's a great block perfect for baby and kids quilts. I'll love to win a copy of this Fantastic magazine. I really like the Central Park as the focal, but I can see using all kinds of things in there. Great block. cute block , I can hardly wait to get this magazine I have bought the others and really enjoy them. Nice block and a lovely baby quilt. Hi! I love your block. It's simple but effective! A lot of possibilities, and you get to show off a novelty fabric in the middle if you want. Nice! I am really enjoying the blog tour and seeing all the marvelous blocks! Great job on your block, and thanks for the links to the other featured designers. Pretty block. A nice way to use novelty prints. Cute way to feature a novelty fabric. Thanks for the great block! 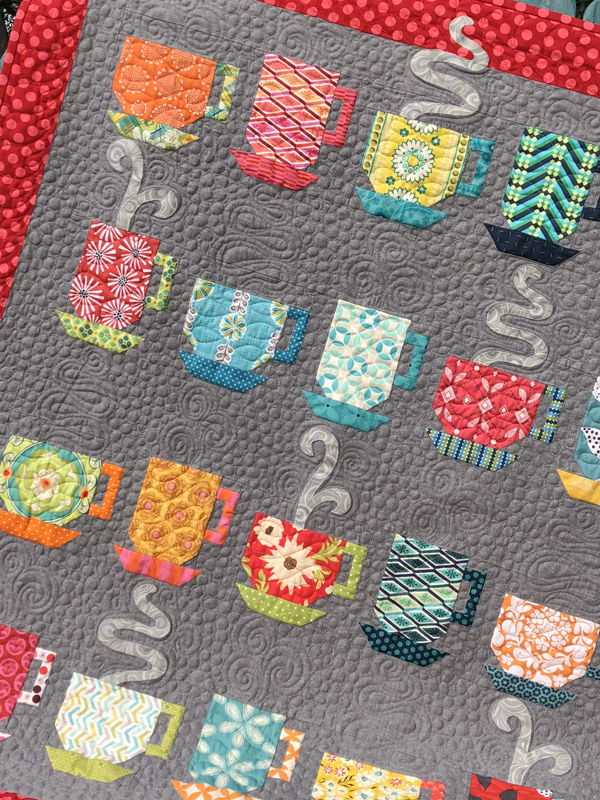 Vickie, your block looks so cute in Kate Spain's fabric. I love it. Congratulations! 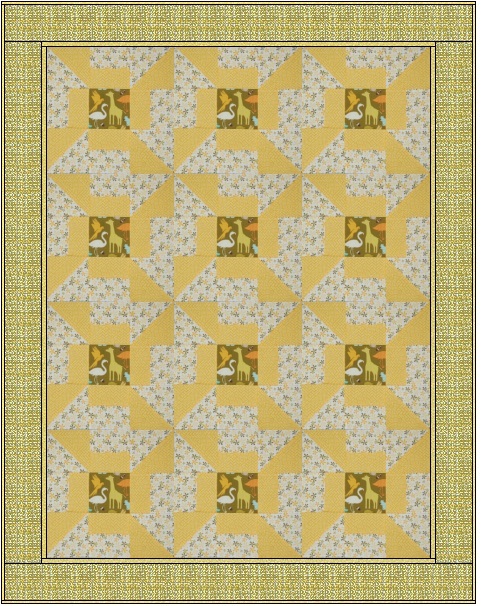 I always like blocks with one fabric highlighted in the center! But yours is especially fabulous when put into a quilt setting, for a great secondary pattern is created! Great job! I like your block. So very cute in the Central Park fabric. fabric in the bottom triangle. thanks for the chance to win. This could make a wonderful "I spy" block for kids! Thank you! Cute block. This is so much fun. Congratulations on having your block as part of the magazine. I really like your block design and the choice of a print is the center is great. I can also envision a small embroidery design in there too! Thanks! Your block is very cute! Especially using the animals in the middle block of the quilt. Love it! It looks like an exploding pinwheel! I love it!!! Lots of blocks arealready have on my TO-DO list and all I need is the Magazine. Hope I'm a winner. Your block does a great job of framing the center square and I like the pin wheel secondary design that is formed when you sew the blocks together! Way cool! Congrats for having your block in the magazine, Vickie! Thanks for doing the giveaway and thanks for counting me in. Congratulations on your block...really cute. Great block...simple but interesting....my favorite kind! I would love to win this. My mom has the previous one and I have looked at it over and over. Thanks! Congratulations on getting your block published in Quiltmakers 100 Blocks. Great block. Excellent choice for novelty fabric. I like your block and your choice of fabrics. Thanks for a chance to win a copy of the magazine. Hi Vickie I really like the block thanks for inviting us into your blog and congratulations to you. A block that's really different for a change. Very original block. Looks great in your sample quilt. Your block would do great for any children's quilt...I can see it done in lots of brights...you could even scale down the size and use it for a baby's quilt. Very sweet block. Love the color choice. Really uptown block - like the block like the sets -- Congratulations on making QM 100 v3! Fun use of a focal fabric. I'd love to use that fabric in my 'Elephant's Play' quilt. Congrats on being in Vol. 3. 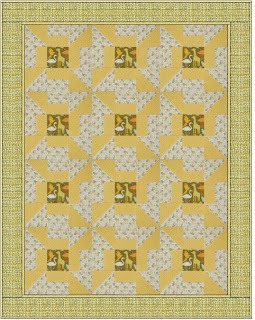 Oh the block is so cute and would be a great baby quilt with the Central Park prints especially with the giraffe. Thanks for a chance to win. I would love to try your block in some of the new Christmas bundles! Great block, congratulations! I love Central Park, and you used it so well. Hooray for you! This looks like a great block to make a photo quilt. Congrats...again! Cute block and yet simple to do..you did it again. I LOVe your block! it's soo cute! I can't wait to get my hands on this book! I love the secondary pattern your block makes. Congratulations on being featured in the magazine. Thanks for the giveaway. I love the quilt magazine. Glad you have a block, they know talent. What a great block for novelty fabrics, I have a good many. The surrounding block gives the illusion of movement, lightning maybe... possibly due to the gold fabric you used. I am assuming it was 12 inches which would probably mean the novelty print is 3 inch square pieces.. very nice. Great block - I know you are proud! Thanks for the chance to win! Congratulations on having your block chosen for the magazine. I really like your fabric choices. Yellow...my favorite color! Love the block. Very Cuter Block and Congratulations on being published, I'm sure you are very pleased. perfect block--easy enough for beginners but has a dynamite presence when you put a few together! Love your fabric choices!! p.s. the reindeer from Countdown to Christmas are my fav too! i look forward to seeing what you'll do with them! What a cute block to highlight a novelty print. Congratulations on being in the magazine. Ooh, I recognized the beautiful Central Park right away!!! Love your block and the fabric! What a great block to showcase a novelty print. I love your block. Looking at it with my 3 yr old son, he mentioned that it looks as though other birds are "sniffing the other animals in the square in the center". He cracks me up :) Congrats on being included in the magazine!! Congrats on the feature. The block is very nice. Such an adorable block - the center square is so precious! Your fabric choice is terrific!